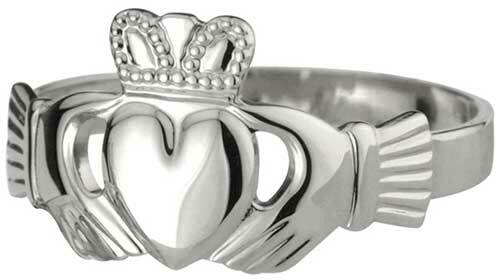 Claddagh ring is a ladies' white gold design that features a puffed heart. This white gold Claddagh ring has been hallmarked 14K gold by the Irish Assay Office at Dublin Castle in Ireland. This white gold Claddagh ring features a traditional design along with a puffed heart. The 14K gold Claddagh ring measures 7/16" tall from the top of the crown to the bottom of the heart. This white gold Claddagh ring is available in sizes 4 through 10, including half sizes. Claddagh ring is our smallest white gold design; it is suitable for a baby or child or a woman with smaller fingers. Claddagh ring features heavy weight 14K white gold construction along with puffed heart. This 14K white gold Claddagh ring is a light weight design and is a smaller size that is suitable for small women or children. Claddagh ring is a white gold design that features the Irish symbol superimposed.